Divide students into groups or pairs and have them act out the role play cards. Let students use the role play cards and complete the conflict resolution graphic organizers. Have students design a poster about peace. Have students design a poster about the steps to resolving conflict. Pair students up to discuss 3 different conflicts they?ve had, one at school, one at home and one with friends. Discuss the conflict and the outcome. Reflect on whether it could have been solved differently. 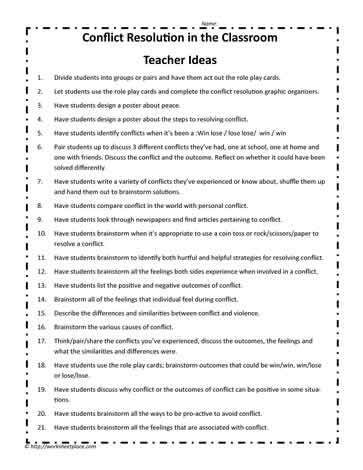 Have students write a variety of conflicts they?ve experienced or know about, shuffle them up and hand them out to brainstorm solutions. Have students compare conflict in the world with personal conflict. Have students look through newspapers and find articles pertaining to conflict. Have students brainstorm when it?s appropriate to use a coin toss or rock/scissors/paper to resolve a conflict. Have students brainstorm to identify both hurtful and helpful strategies for resolving conflict. Have students brainstorm all the feelings both sides experience when involved in a conflict. Have students list the positive and negative outcomes of conflict. Brainstorm all of the feelings that individual feel during conflict. Describe the differences and similarities between conflict and violence. Brainstorm the various causes of conflict. Think/pair/share the conflicts you?ve experienced, discuss the outcomes, the feelings and what the similarities and differences were. Have students use the role play cards; brainstorm outcomes that could be win/win, win/lose or lose/lose. Have students discuss why conflict or the outcomes of conflict can be positive in some situations. Have students brainstorm all the ways to be pro-active to avoid conflict. Have students brainstorm all the feelings that are associated with conflict.